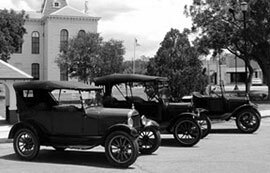 Welcome to this San Antonio Ford Model T web site, hosted by the Texas Transportation Museum on behalf of the "T Fords of Texas," San Antonio's Ford Model T club. The club, the museum and many individual owners are keeping the Model T alive in San Antonio and surrounding region. 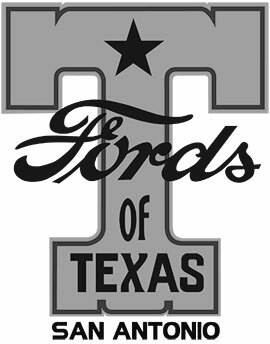 There are at least 170 Ford Model Ts of all types in South Texas - that we know about ! It seems like more and Model Ts and owners keep emerging. Some have no idea there are so many more Ts out there. One moment they are struggling alone and the next they are enjoying the company and support of some of the nicest folks you'll ever meet in the old car hobby. The "T Fords of Texas" tries to do something special every month. Check out the Model T Event Calendar in the right hand column for details about all upcoming T related events. Activities include cruises around San Antonio and other towns in the region, car shows, parades and charity events, plus technical sessions on subjects as diverse as basic maintenance to how to change transmission bands. 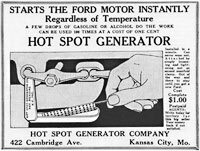 You never stop learning when you have a Model T.
Membership in the "T Fords of Texas" is not expensive. 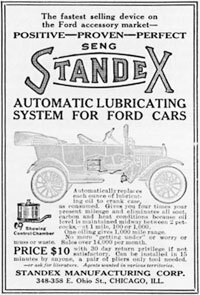 You don't even have to own a Model T ! All you need is enthusiasm for the vehicle that put the world on wheels and changed life all the world. 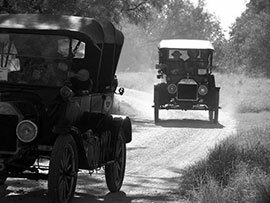 From its ground breaking design and legendary toughness and reliability, the Model T blazed trails that we are still following today. Use the Contact Us tab to get more information about how to join. 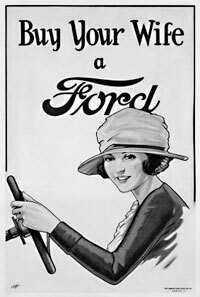 Here are links to both national Ford Model T clubs. Click the logos below to visit their web sites. The Model T Ford Club International is based in Hudson, North Carolina. Membership includes their "Model T Times" magazine. 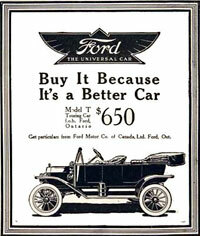 The Model T Ford Club of America is based in Centerville, Indiana. 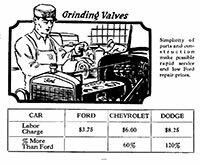 Membership includes their "Vintage Ford" magazine. See "Events Calender" page on the right for details about upcoming events, and "Activities" pages for images from T related activities. 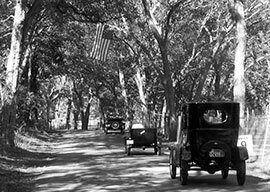 Ford Model Ts on River Road near New Braunfels. FREE for participants and public ! Click "Model T Show" links on the right for more information, and pictures of previous T shows. 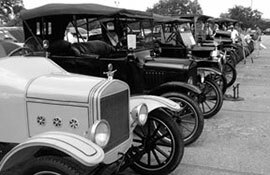 The "San Antonio Ford Model T Show" is the area's biggest annual Model T event. 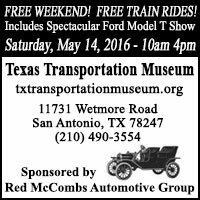 It is held at the Texas Transportation Museum, 11731 Wetmore Road, San Antonio TX 78247. This year's show is on Saturday May 14, from 10 AM to 4 PM. 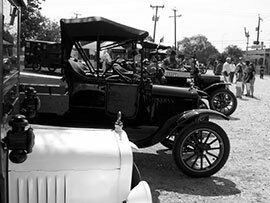 More information about this huge gathering of Model T from all around South Texas can be found on the links in the right hand column. 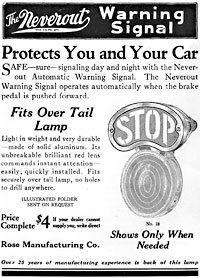 There are usually around 30 and 40 Model Ts of all kinds, from single seat race cars to ambulances and one ton trucks. The Ts come from across Texas, from San Angelo to Schulenburg. 2016 will be our 10th annual event. Thanks to the continuing sponsorship of the Red McCombs Automotive Group, admission to the event, and the entire museum, including train rides, is ABSOLUTELY FREE !!! Car shows and parades are great but what Model T owners really likes to do is simply drive our cars! We choose destinations within San Antonio, such as Brackenridge Park or the historic missions. We also take our cars by trailers out of the city and go on scenic back roads tours. We have been to Medina, Guadalupe and Caldwell Counties. These tours bring out the best in our club. Great cars, great company and great food that we either bring ourselves or at wonderful local restaurants. You will find Model Ts at most open car shows in our area. We take part as a group and individually. If possible, like the Shriner Charity Show pictured above, we try to get there early and claim a group section, or you may find us spread out among the other collector cars.